Snapper – Chrysophrys auratus – New Zealand’s most popular fish! Brent LeBherz with a 13.5 pound Marlborough Sounds Snapper. 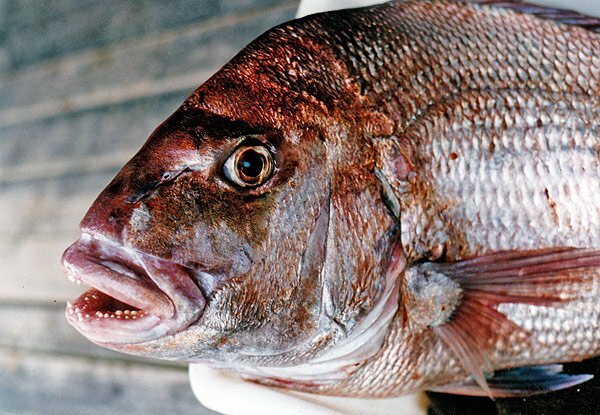 Snapper is by far New Zealand ‘s most popular fish. 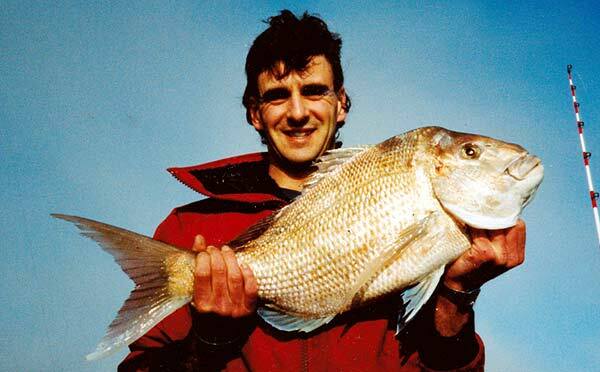 Snapper is the fish all New Zealand sea anglers want to catch the most! They are good fighters and excellent to eat. They are mostly a North Island species. Although caught in the Marlborough Sounds and down the West Coast of the South Island this is really the southerly limit of their range. Numbers caught in the South Island are very small. Most South Island anglers would probably have never seen a snapper – except perhaps in the fish window of a supermarket. They are reasonably common in the Marlborough Sounds – especially smaller fish. 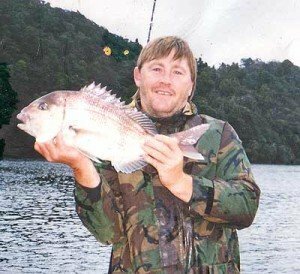 Robin Isherwood displays proof that you can catch snapper in Fiordland. It is by no means a typical catch! Nonetheless, there is good sized snapper roaming the fiords. Photo by Keith Chin. Snapper is the only sea bream found in New Zealand waters. A really big specimen can measure as much as one metre in length and weigh as much as 20 kg. Snapper is common to the North Island of New Zealand. They can be found on the West Coast of the South Island as far south as Fiordland. They are also found in reasonable numbers in Tasman Bay and the Marlborough Sounds. Certain parts of the North Island are known to have smaller snapper, in particular, smaller juvenile fish are found in large numbers in the Hauraki Gulf. Fish on the west coast of the North Island are generally bigger. Forty years ago snapper was caught in good numbers by surfcasters off the beach behind the old railway station at Kaikoura whereas this is unheard of today. 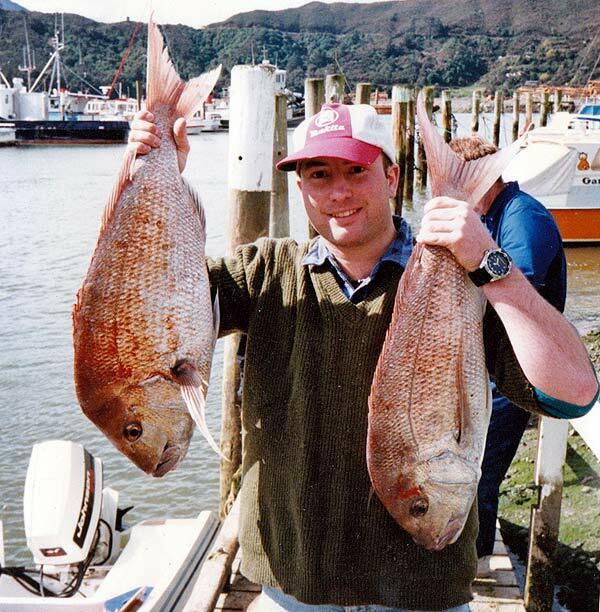 Snapper were rare on the east coast of the South Island south of Marlborough. The fish North Island anglers want to catch the most is a big snapper exceeding the magical old 20-pound mark. Such big fish were once quite common in the upper South Island particularly around D’Urville Island and French Pass. It would, however, be rare to catch a big one like that today. They were also quite a common catch in the inner Marlborough Sounds as well. Good numbers used to be caught in Kenepuru Sound in particular. They are still there but their much smaller numbers make them difficult to catch. Healthy Food Guide: Here’s everything you need to know to cook fish to perfection, every time. Ben Grady with a brace of big snapper. This species is caught all around the North Island and are targeted by numerous methods including surfcasting, light tackle boat fishing, jigging, long-lining and in recent years are a popular target for anglers using soft baits. Big fish will take quite large baits including whole live and dead baits. Large specimens have been known to exceed 20kg. Adults generally range between 30 to 80cm in length. Bruce Gardner with a big 11kg snapper he caught near Maud Island, Pelorus Sound, while staying at Waitata Bay. 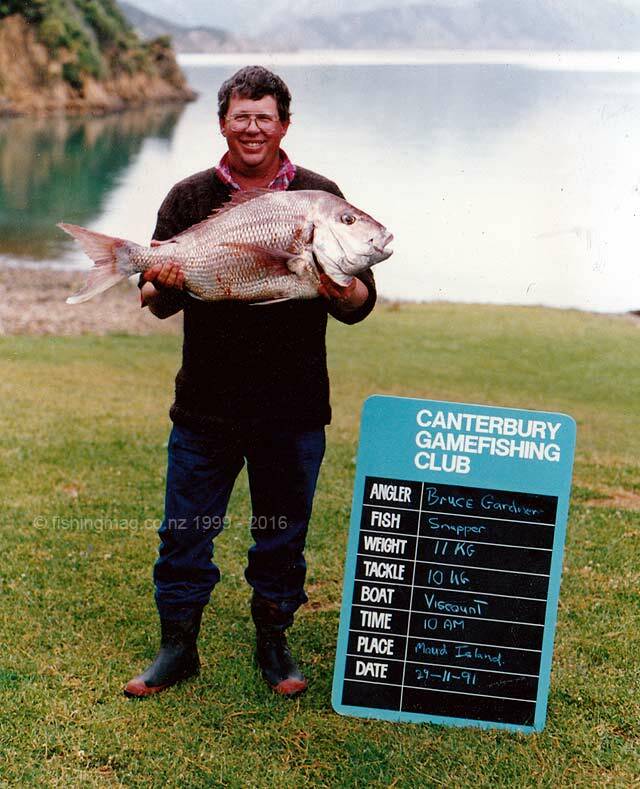 Big 11kg snapper caught at Maud Island by Bruce Gardner, Pelorus Sound, Marlborough (same fish as in above picture).